Part 1: Please prepare for this, making written notes, comments or paragraphs. You will need all records to appear, as evidence of reflection, self-evaluation and discussion on your professional blog. Reflective Question: How do I continue to advance my professional learning as a teacher/leader? I think because I missed out on so much learning time during high school, I am trying to catch up! I find learning very rewarding. Deep down, I am a huge geek. I love the process of identifying something I need to get better at, setting myself a goal and then working hard to achieve it. I love the feeling of success once I have mastered a new skill. I am a social learner, so I find JK and collaborative teaching very rewarding. I continue to learn form my colleagues around me. Over the past 2 years, I have grown my PLN (personal learning network) via Twitter (check me out! on @fuse711). I can't believe just how much I appreciate connecting with like-minded educators from around the world; connecting with movers and shakers! There are iPad, techie tips, minecraft, inquiry, learner agency, growth-mindset, numeracy, literacy ideas galore! It's pretty open to challenge each others' ideas and have a conversation about learning. More recently, I have joined the NZ Teachers Facebook page. I am not quite sure what to think about this yet. I haven't agreed with everything that has been shared or said but I'm not sure if it's the same forum or setting to challenge ideas. However, there are still some peals in there if you sift through the clams. In sum, teaching and learning is fast growing to online, global connections. We have to get amongst it. This year, my goals are around being an effective leader. I now see my teaching colleagues in a new light. It's hard being a leader at times - there are some tricky conversations to have with people so I am "in the learning pit" knowing how to approach different situations. I watch David like a hawk: how he listens, or jumps in, or parks something and moves on; how he challenges people. I like how he is always very good at explaining how and why something relates back to a policy or law. James also mentors me once a week. I talk with him and we unpack the what and the why. This is very helpful as I try to make sense of everything :). 6. Reflective Question: What do I take into account when planning programmes of work for groups and individuals? Planning for individuals, I think is one of the hardest aspects of teaching (or maybe it's just the hardest for me?). I believe that the best learning takes place when the teacher has developed a positive relationship with the learner. Teachers need to take an interest in their learners and really find out what makes each tick. What are their habits? What is their personality? What mindset do they possess? Are they introverted? Are they extroverted? What drives their learning? What are they passionate about? It takes time to discover this for 30 students. So once a teacher has established this relationship, individualised and personalised learning can flourish. Initially, I believe the role of the teacher is to provide inspiration, controversy, challenge and support. Then carefully, purposefully and strategically coach, guide and provide timely feedback and feedforward for learners. I think I'm about at that point now with most of my students. There might be one or two that I haven't worked out, yet. But I'm working on it. Now that I have developed those important relationships, I can tailor my examples, questions, directions and better extend kids thinking. 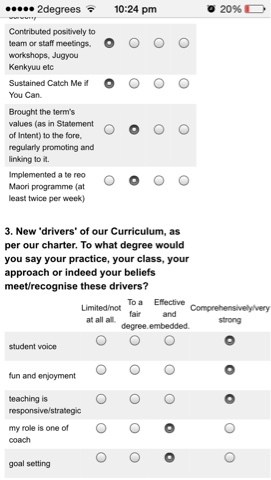 Reflective Question: Outline what the drivers (principles) of your maths programme are. 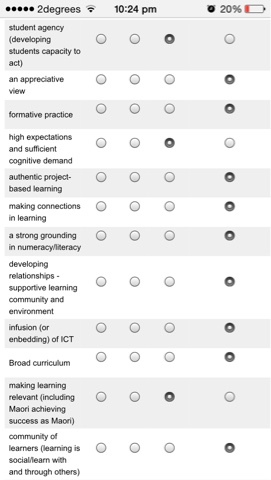 Explain your developing ‘theory of action’ for maths. (How you are teaching it and why) Refer back to your writing ‘theory of action’ …where are the similarities? Wow! I can't believe how many similarities there are between a writing theory of action and a mathematics theory of action! Working with Dinah this year has been some of the best professional development that I have been a part of! Is this because maths for me is something I have to do, not something I love? Because this year, for the first time ever, if I have some extra time in my day to do something - I'm doing maths! Crazy eh? Dear Ms Wall (my 3rd form maths teacher). I am so sorry for all the pain I caused. Maths is actually really amazing. Deliberate acts of teaching are key. 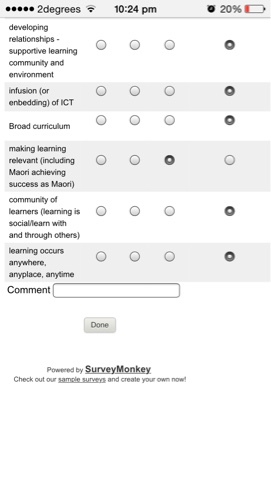 See (survey monkey) survey. Use the scale shown. When meeting with your Team Leader, table this and lead any discussion that may be important. Bring up your staff blog. 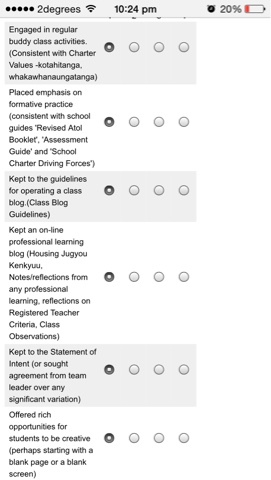 Outline progress in your inquiry to date. What change has there been in your focus group? How do you know? How has your practice changed? Where do you think this might go next? I enjoyed our quick catch up today and I know we will catch up in more detail over the next few days, but you got me excited to check out your blog. Nic, you are a really deep thinker, so your reflections are full of real life examples and experiences. These examples hold deep value and are a great way for you to make connections with your akonga. The similarities in your theory of action for writing and math are uncanny. It's funny how two subjects can have such similar focuses and reasoning. I really love how your enthusiasm for maths has grown sense our PD with Dinah and this will definitely start reflecting on your students.